Has the LAT reached its tipping point? 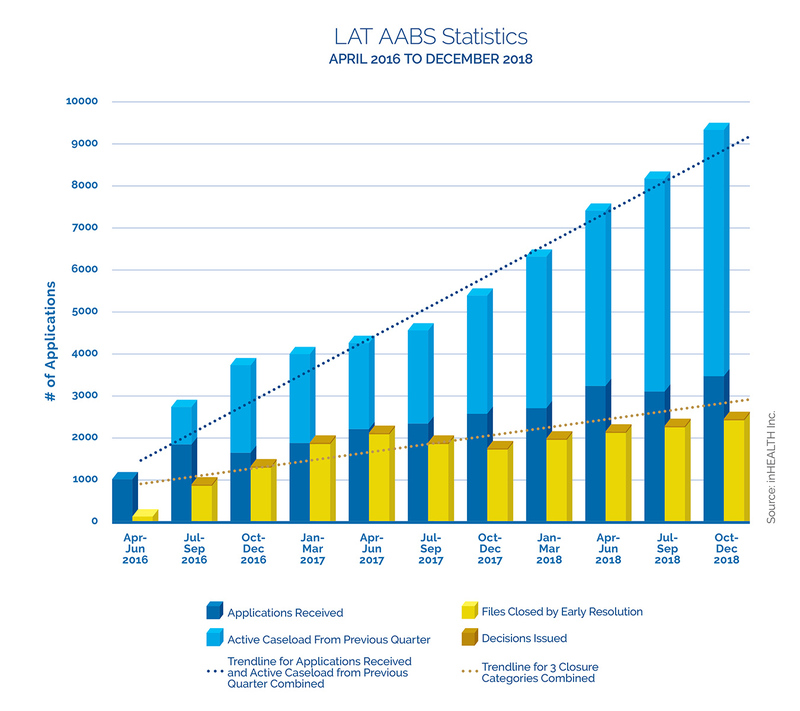 By year end 2017, we were asking if the LAT was being “overtaken by events” with steady growth in LAT applications outpacing closure activity, resulting in an active caseload of 3,601. 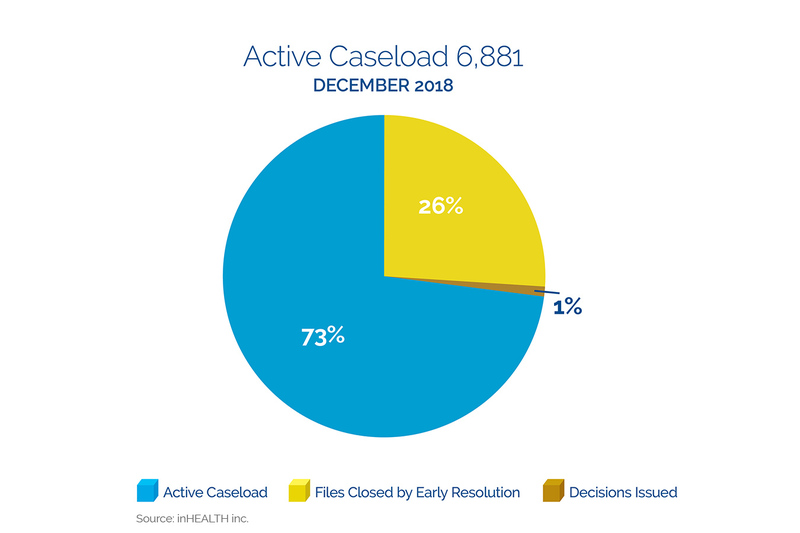 Now 9 months later, the trend continues with a drop in closure activity from 33% to 27% resulting in an increase in active caseload to 6,881. Has the LAT reached its tipping point? Over the course of 2018, the LAT continued generally to demonstrate productivity improvements, however again nowhere near the rate required to keep pace with significant ongoing increases in applications received. At closer look, the LAT made improvement in 2018 on the average monthly closure activity when compared to the prior year. In 2017, there were on average 633 cases per month with early resolution, with the current year averaging 780 per month, an increase of 23.2%. At the same time, the average monthly decisions issued went from 25.5 to 31.9 per month, an increase of 25.1%. Taken together, these two measures reflect an overall average monthly closure increase in the current year of 23.2%. 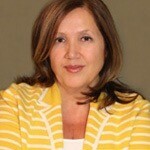 When did the caseloads become unmanageable? While the monthly closure activity was increasing, so too has the rate of new applications. In 2017, there were 843 new applications per month on average. In 2018, this increased by 31.6% to 1,109 per month. 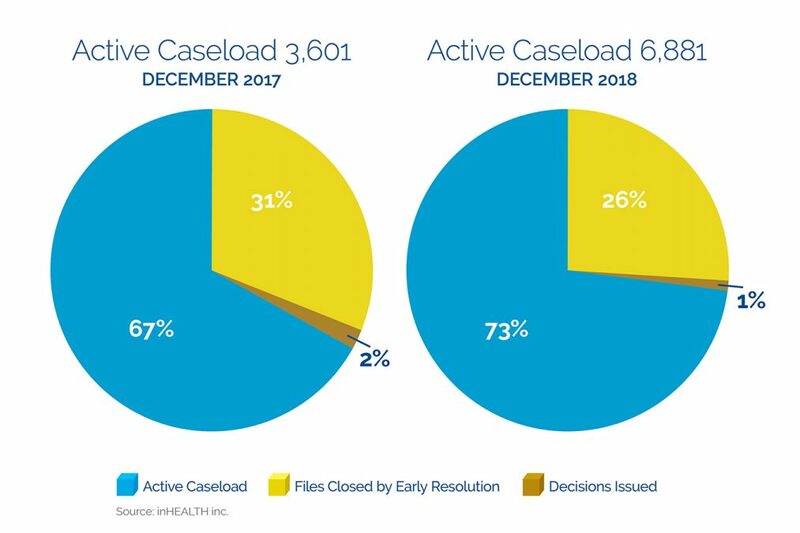 Consequently, the active caseload has increased 91%, from 3,601 to 6,881 in the same period. It seems fair to ask at what point the caseload became unmanageable? The year ending 2017 reflected an overall early resolution rate of 72%. By year end 2018, this remained relatively stable at 71.3% since the inception of the AABS. This would therefore appear to be the anticipated rate going forward. During the current fiscal year, it is clear that the LAT has been very active in prioritizing case conferences. Compared to the prior fiscal year, the average case conferences per month has increased from 480 to 725, an increase of 51%. Perhaps as a result, during the same period hearings held decreased from 42 to 35 per month, a decrease of 16.7%. Although the LAT has increased productivity year over year by 23%, it is nowhere near what is required to make progress. That is if you define progress as a manageable active caseload, that meets the intended goal of expediency, procedural fairness and timely access to justice. There does not seem to be any reasonable prospect that the current trends will reverse. Despite best efforts, the LAT cannot keep pace with an ever-increasing demand. The need for diversion is clear. Stakeholders need to determine means by which they can significantly reduce the number of LAT applications entering the system. Perhaps implementation of a more robust gatekeeping process together with a voluntary or preferably mandatory pre-step assessment would facilitate, at least to some degree?